The way of the cross is not confined to a lonely road in Jerusalem two thousand years ago: it is a busy highway winding through every village, town and city in our modern world. Fr Denis reflectively guides us along the way of the cross. 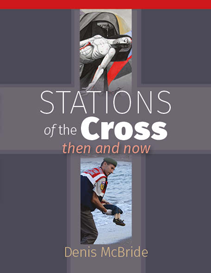 He contrasts the beauty and solemn simplicity of the more traditional Stations by artist Curd Lessig with modern images that challenge us to link Jesus' story to the struggle of our everyday life. 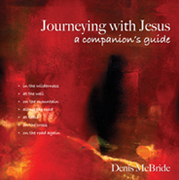 Through its rich array of scripture passages, paintings, poetry, prayers, photographs and reflections, this book becomes a companion not only on our Lenten journey but throughout the year: suffering is not limited to one liturgical season. 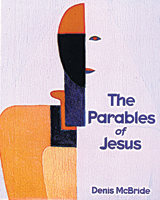 Whether we walk in solitude or with others, this book translates the passion of Jesus into our own life and times. Last night I went to hear Fr Denis speak about the passion of our Lord in the Gospel of Luke. With three hundred other people, I was drawn into a wonderful narrative of Luke's story. 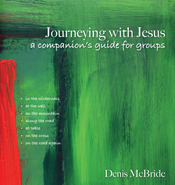 At the end I bought Fr Denis book on Praying with Pictures, and when I got home, I sat down and read the whole book. I still had his voice in my head and I heard that gentle voice over and over in these wonderful prayers. I love the idea that no matter what condition you are in, you can pray to God; no matter who you are, what you're going through, you can approach the God of all mercies. I didn't get to bed until late, but I went to sleep really content. Thanks sincerely fordeepening my faith in the kindness of the Lord. 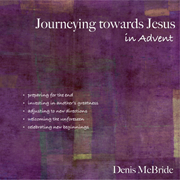 After two successful volumes of Reflecting with Paintings, Father McBride tries 'to find a voice for all sorts of people and situations' (p.15) using beautifully produced pictures with which to inspire prayer. Not that we have to follow his thoughts; he is very happy should the subject 'stir you to go in a totally different direction from mine, and make your own prayers in your own words.' (p.15). 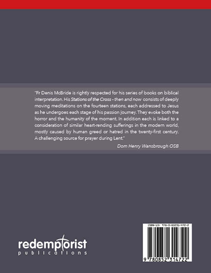 His introduction on 'How to pray' is excellent, and there is an easily skimmed 'Contents' to locate a suitable prayer. The photo and prayer are spread over two pages, and there is no need to turn pages - and lose the image. He has the gift of an easy, yet profound style, and is able convincingly to get into the persona of a subject. Prayers include one before eating, for the dead, by a gay man, by a woman whose husband is leaving her, by a spy, by a soldier and one for Armistice Day. If stuck for words, these prayers will help one to say what one wants to pray, whether the situation is a personal one or whether one is praying for someone else. We look forward to this becoming a series. "The best moments in reading are when you come across something - a thought, a feeling, a way of looking at things - which you had thought special and particular to you. Now here it is, set down by someone else, a person you have never met, someone, even, who is long dead. And it is as if a hand has come and taken yours." Fr Denis has this strange ability to create a fellowship with strangers. The experience of reading him is to be caught in empathy for the most unlikely - and sometimes unlovely - characters. I am unsure how he manages to make a claim on our sympathy, but perhaps this is, somehow, a reflection of the Gospel of Jesus? The idea of Praying with Pictures is one which could bring us into a whole new experience of prayer. To look thoughtfully at the beautiful pictures in this book draws us in loving attentiveness to the Creator. The captions serve as pointers to the reality behind the photographs. Then the prayerful readings draw together the graces of this world and the promise of the next. Knitting together the beauty of our surroundings to which the eye is readily drawn with the heartfelt accompanying prayer constitutes a moment of grace. Do not miss it by the modern sin of overlooking the simple. In the world of today, where the lurid, gross and vulgar are often loudly presented as the "unmasking of truth" and called "reality" we are like the proverbial "bull in the china shop" missing the subtle beauty of the veil which enhances the mysterious. Fr Denis McBride listens to those people and things the significance of which is too often missed. Clearly, in his ministry, he listens and cares for whatever people come into his orbit. He is quick to notice the areas of pain and pleasure - children, love, injustice, giftedness in all creation. This is a book that enables us to see the value of taking time off from the muddle and mess of life and going to the hills and to the sea. Simply to contemplate what is delightful can bring us to new hope and serenity. 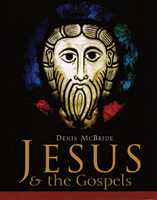 It is Denis McBride's hope that from this book will fall the grace of our becoming , automatically, people of spontaneous prayer. But it is not only the escape from the daily that is joy-bringing. The capacity to look at what is really happening in our own home, our own back yard and our own high street - the drooping body of the aged, the lithe movement of the adolescent, the reaching out of the imprisoned, the smile of the disadvantaged, these challenge us to open the eyes of our hearts and bring the varied commonplace situations to The Father. Fr McBride encourages us to look more closely at ourselves - in God's terms. We need to forgive ourselves for falling short of our ideals, doubting the whole point of prayer, and thinking that maybe God is "as feeble as I am powerless to change anything... Nowhere around". Such feelings call out for the faith-filled "Yes" of Mary at the mysterious message of the angel at the Annunciation. We think ourselves unable to persevere in humble acknowledgement of our littleness and tiredness. Fr Kevin encourages us to pray "Keep me Lord, in converstaion with You; otherwise I might lose the little of me that is left." Here is a book that helps us to remain in that communication and encourages us with moments of glory. Bought a copy of this book for my big sis, then read it when I got home and decided to keep it for myself - will buy her another, don't worry! Laughed out loud when I read the kid's prayer, Are parents really necessary, Lord? It reminded me of me a few years ago. Am studying English at uni and wish I could write like this. The voices are real, quirky, individual. Love to meet most of the characters. Many thanks for helping us to find a voice to pray.